Lenovo launches new Yoga products. InVue provides the muscle behind them. 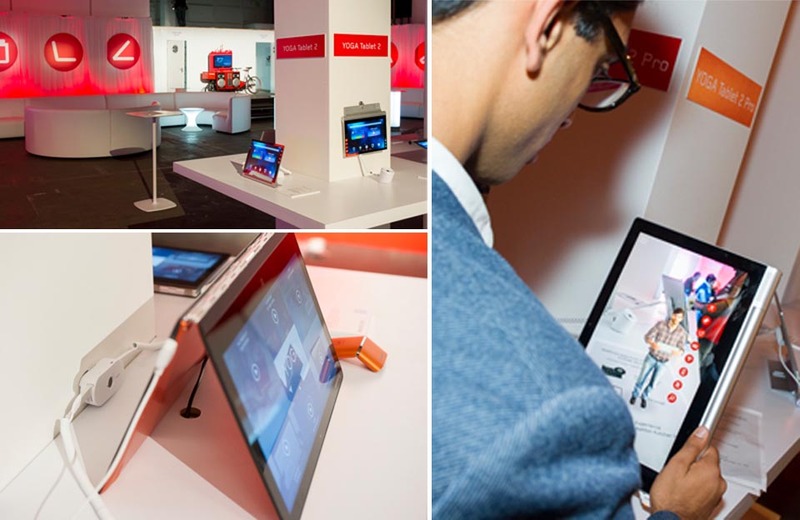 On October 9th, Lenovo announced the launch of their new Yoga Tablet 2 and the Yoga 3 Pro at The Old Sorting House in London. InVue’s S950 Tablet and Zips 2.0 were chosen to secure the two Yoga’s due to the flexibility of InVue’s product design, allowing attendees to easily interact with the Lenovo products without interference from the security devices protecting them. InVue’s S950 Tablet is a no compromise solution for security due to its small size, ease of use and reliability. InVue’s Zips 2.0 is ultrafast protection for high value electronics and accessories designed for extreme ease of use and simple installation. S950 and Zips 2.0 are part of InVue’s IR Ecosystem™, a storewide single key security system for all high theft merchandise. Lenovo is a Fortune 500 company providing innovative consumer, commercial and enterprise technology.